Action-Packed iPod Application: Muay Chaiya. iPod Touch Apps, Muay Thai Chaiya is known as the “Art of Eight Limbs” or the “Science of Eight Limbs”. This Muay Chaiya iPod App is traditional Thai kickboxing that is already becoming very popular these days especially in games and movies. With this application, you could even download the introductory video. Buffy Studio is the developer of this game, supervised by Master Lek from Baan Chang Thai. The main objective of Muay Thai Chaiya ipod app is to make you know more about this form of martial arts by watching the different techniques of all these other fighters in slow motion. At the same time, you could even listen to the Master Lek’s teachings. What’s Muay Chaiya iPod App About? 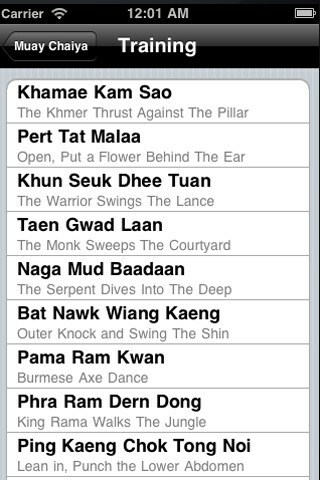 Muay Thai Chaiya ipod app. There is a total of ten videos that you could access after the application’s introduction. You could either choose the video or the training itself in Muay Chaiya iPod App. These two are only different because of Master Lek’s explanations can appear in either one you select. Nothing could go wrong in this Muay Chaiya iPod application. You just have to watch intently and learn about Muay Thai Chaiya app. This application really combines the audio and the visual aspects of teaching the technique. Every bit of information is given in this application so you are going to very well-versed about Muay Thai Chaiya by the end of the entire 10-video series. The designers of this Muay Chaiya iPod touch App exhibits very specific detailing in the techniques. The menus are still according to stardard iOS user-interface components. The art aspect of the application was done very well. It is a very compelling application and you will never tire of watching the videos over and over again. The translation for the videos is excellent and so is the voice utilized. All Martial Arts have to be learned the old fashion way and not just by watching informative videos. But if you are a martial arts buff that would definitely get a high from applications such as this, then Muay Thai Chaiya ipod app is the things for you. Download Muay Thai Chaiya iPod App Here.